In Missouri, if you've been hurt in a bicycle accident you have five years to file your case or you will be barred by the statute of limitations. Feel free to ask for my bicycle accident guide that is free to readers on my web site. In my 30 years of experience, I've handled many bicycle accident cases that involved broken bones, head injuries, internal injuries, back injuries and road rash. Automobile drivers have a duty to drive with the highest degree of care and bicycle riders have the duty to ride with ordinary care. Some times injured riders will have his or her fault measured against the fault of the car operator. This is called comparative fault. Several years ago I handled a bicycle component failure case that settled for over two million dollars. 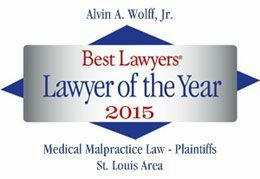 If you've been injured while riding your bike, call Alvin Wolff at 314-241-2500. I ride a lot. I've been in this business for over 30 years. My skills and experience could be the edge that you need to maximize your recovery from the injuries you received from your bicycle accident.